If even the Beach Boys couldn't bring out the sun on Sunday afternoon, then surely the overcast weather was just a lost cause. And although it may have been cloudy, the reunited Beach Boys definitely brightened up the day for the thousands of onlookers. 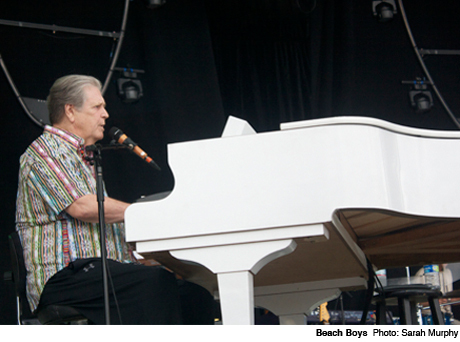 From the minute Brian Wilson, Mike Love, Al Jardine, Bruce Johnston and David Marks walked on stage, it was hard to ignore the senior-citizen factor. But while it wasn't the highest-energy show of the festival, it was by far one of the most nostalgic. Playing a 30-plus-song set, things really picked up around the halfway mark. New single "That's Why God Made the Radio" was followed by "Heroes and Villains" from the finally released Smile, while Pet Sounds trio "Sloop John B," "God Only Knows" and "Wouldn't It Be Nice" preceded a slew of greatest hits. "Good Vibrations," "California Girls" and "Barbara Ann" -- just to name a few -- rounded out the set before closer "Fun, Fun, Fun" provided the perfect description of the show and sent fans off into the last night of Bonnaroo with smiles all around.